What Does a Nurse Educator Do? Where Does a Nurse Educator Work? Nurse educators are registered nurses (RNs) who have obtained advanced nursing degrees that allow them to teach nursing curriculum at colleges and universities, teaching and helping to train the future nurses of the world. They serve as faculty members in both nursing schools and teaching hospitals, transferring their valuable knowledge, experience, and skill sets to their students who will ultimately serve as the next generation of nurses. Many nurse educators, in addition to working in the classroom and teaching, also work in clinical settings. The best nurse educators will exhibit exceptional leadership qualities, have excellent communication abilities, and have in-depth, comprehensive knowledge in their given field. Nurse educators are responsible for designing, evaluating, updating, and implementing new and current nursing education curriculum. These educational professionals act as both advisers and role models for the students, assisting them in their journeys toward becoming successful licensed registered nurses. Nurse educators must have top tier communication skills, possess excellent critical thinking abilities, and have a solid clinical background. Additionally, nursing education professionals must have comprehensive and substantive knowledge in their particular area of instruction. It's essential that nurse educators possess the capacity to convey that knowledge to their neophyte nursing students. Nurse educators should exhibit an intense commitment to lifelong learning, exercise leadership abilities, and be committed to the scholarly progression of the nursing discipline. Lastly, nursing education professionals should have a strong knowledge base in theories of teaching, learning, and evaluation, be able to design curricula and programs that reflect sound educational principles, be able to assess a student's needs, be innovative, and thoroughly enjoy teaching. What Are the Educational Requirements for Nurse Educators? Those looking to become nurse educators will first need to attend college or university and earn a Bachelor's of Science in Nursing (BSN) degree. Upon obtaining a BSN degree, the National Council Licensure Examination (NCLEX-RN) can be taken. Once this exam has been passed, the graduate is eligible for licensure as a registered nurse (RN). After earning a BSN and becoming a licensed registered nurse (RN), the next step on the path to becoming a nurse educator is to obtain an advanced degree. 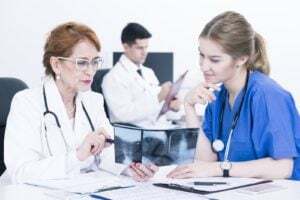 Advanced degrees can come in the form of a Master's of Science in Nursing degree (MSN), a Doctor of Nursing Philosophy (Ph.D.), or a Doctor of Nursing Practice (DNP). MSN university programs are offered both online and in traditional classroom settings. MSN coursework is more advanced than classes taken during bachelor's degree programs. These post-baccalaureate programs seek to build upon the knowledge that nurses have gained via their undergraduate curriculum. For individuals who are particularly interested in the academic side of nursing, there are Doctor of Nursing Philosophy (Ph.D.) programs. Doctor of Nursing Philosophy programs seek to teach students not only research tactics and leadership, but public policy as well. Additionally, some universities offer MSN/Ph.D. dual degree programs. According to the American Association of College of Nursing, prospective nurse educators who seek a career at the highest level at colleges or universities should obtain some doctoral degree in nursing. Individuals who have completed Doctor of Nursing Practice (DNP) or Doctor of Nursing Philosophy (Ph.D.) programs will be best suited to become nurse educators. Nursing Ph.D. programs will heavily emphasize research, while DNP programs mainly focus on clinical practice. Most employers hiring nurse educators will require applicants to have their nursing license along with a minimum of a Master's of Science in Nursing (MSN), and anywhere from two to five years of experience in a clinical setting. Read about nurse educator programs. Individuals who are interested in becoming a Certified Nurse Educator (CNE) must take and pass the National League of Nursing (NLN) certification exam. Read about post master's nurse education graduate certificate programs. If I Have an MSN, Does That Mean I Have to Leave the Bedside? What Are Some Pathways for Nurses Who Want to Focus on Teaching? What Is a Diabetes Nurse Educator? Are Nurse Educators Still Used in Hospitals? Nurse educators teach nursing students. They are responsible for designing, implementing, evaluating, and revising educational programs for nurses. Nurse educators may teach general nursing classes, or they might focus on specialized areas of nursing, like pediatric nursing, psychiatric nursing, or nursing informatics. Nurse educators may teach courses included in formal academic programs leading to a degree, or in continuing education or credential/certificate programs. At some point in a nurse educator's career, they will be expected to create a new nursing course or update an old course. It is for this reason that nurse educators are expected to be at the leading edge of clinical nursing practice. They must always stay current and up-to-date regarding the latest nursing trends, methods, developments, and technologies that are available. To achieve this, most nurse educators continue to work as professional nurses in their field and continue to actively participate in the larger nursing community through various professional nursing organizations. To be effective at their jobs, nursing education professionals need to have both excellent leadership skills and an in-depth knowledge of their field. What Are the Roles and Duties of a Nurse Educator? Nursing education is a career that is in extremely high demand. The U.S. Department of Labor announced that 1 million new and replacement RNs would be needed by 2020. The American Association of Colleges of Nursing reported that almost 65,000 qualified applicants were turned away from nursing schools last year due to a shortage of nurse educators. According to the U.S. Bureau of Labor Statistics, between the years 2014 and 2024, post-secondary nursing teachers are expected to see a 19% growth in employment-an above average growth rate. In May 2015, the average annual salary for nursing educators and instructors was $73,150. However, this number greatly depends on the amount of clinical and teaching experience a nurse educator has and the particular location of employment. Teachers working during the academic year are paid their annual salary over a nine-month period. Compensation for summer teaching is usually paid separately from the main school year. Annual salaries tend to rise for nurse educators who complete a doctorate and for individuals in charge of administrative or leadership responsibilities at academic institutions. Additionally, nurse educators can earn extra money by caring for patients. Because an experienced nurse can make more money caring for patients than they can teaching, nursing schools are quickly moving to offer higher, more competitive salaries to attract more nurses into education. Extreme shortages in nursing educators have prompted government agencies, professional groups, and some nonprofit organizations to launch campaigns that encourage young people to choose a career in nursing education.